Berlin-based live duo and production unit, OPERANT,have progressively carved out their own space in the scene with boundary-defying electronic explorations, fuelled with tension and obscurity. A collaborative project between Instruments of Discipline founder, Luna Vassarotti and August Skipper, OPERANT have been serving a selective stream of output through the label with a focus on Techno, Noise and Experimental. Characterised by unrestrained experimentation, the project brutally morphs itself as it pleases, both in performance and in the studio. 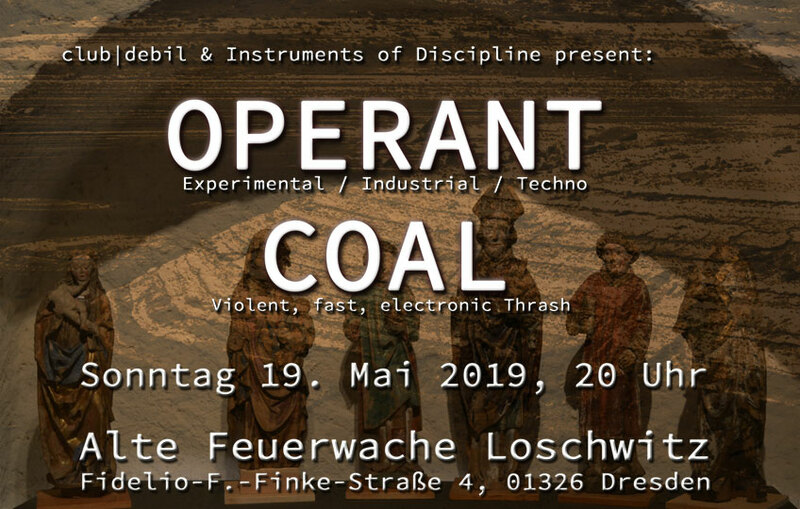 Violent, fast, electronic thrash; COAL is a duo newly formed in Berlin, Anthony Arcana and Oliver Kohlenberg both come from a background in metal and punk and have found themselves in the electronic scene. The mix of their influences and attitudes have made Coal’ssound a rare type of chaos, fast rhythms and noisy mess. The band’s recent live appearances include performance’sat Urban Spree in Berlin for Krake and an Instruments Of Discipline showcase.Their live shows are a fuse of distorted guitars, gritty vocals, crashing percussion and a visual experience that ties any loose ends. The band is finishing their upcoming EP for Berlin label, Instruments of Discipline label, due out in April 2019.